Got this marinade recipe from the waitrose website. They used it to make steak wraps but it sounded like a good marinade for tofu - it is. Has a nice sweet/sour thing going on, the original called for honey - maple syrup would be wonderful but I had some agave nectar I really wanted to try so used that. It makes a lot of marinade but I'm sure it will keep in the fridge. I was going to just serve the tofu like a 'steak' with rice and steamed broccoli on the side but saw some red onions and decided to skewer them. Whisk together the marinade ingredients then pour over the pressed tofu. Marinade for about 15 - 30 minutes, turn once. Meanwhile brush a grill pan with some of the olive oil and griddle the onions until soft and slightly charred. Remove and set aside. Get the water with salt on for the rice. In a small saucepan pour the remaining marinade in and bring to the boil, reduce heat and simmer for 10 - 15 minutes or until thickened. Brush the grill pan with more oil and griddle the tofu cubes on all sides for about 6 minutes, brush on some of the thickened marinade as needed, you want them nice and glossy. I then tossed the onions and steamed broccoli onto the grill pan just to quickly heat them up. 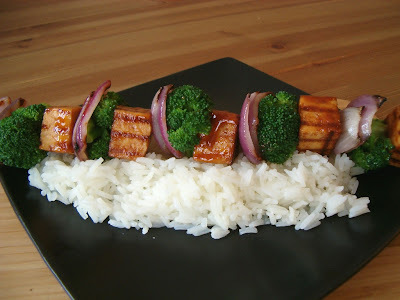 Skewer onions, broccoli then tofu onto the skewer. Drain the rice and tip onto a plate and serve skewer over top. Makes 1 skewer with rice.